I have been sort of haunted by the selfie song in the past few months and always ended up posting pictures with the caption 'So, just let me take a selfie' on my Instagram or even Facebook. Recent trend of #selfie, which mean a self-portrait photograph on camera/handphone has slowly transformed into #wefie, which mean photo taken with 2 or more people. After all, everyone of us has practiced sort of selfie/wefie skills, with even owning a monopod, capturing from the highest position for a perfect angle. I guess with so many inventions and years of training, everyone will be a professional in selfie. So, without waiting, it's time for you to show off your selfie skill! 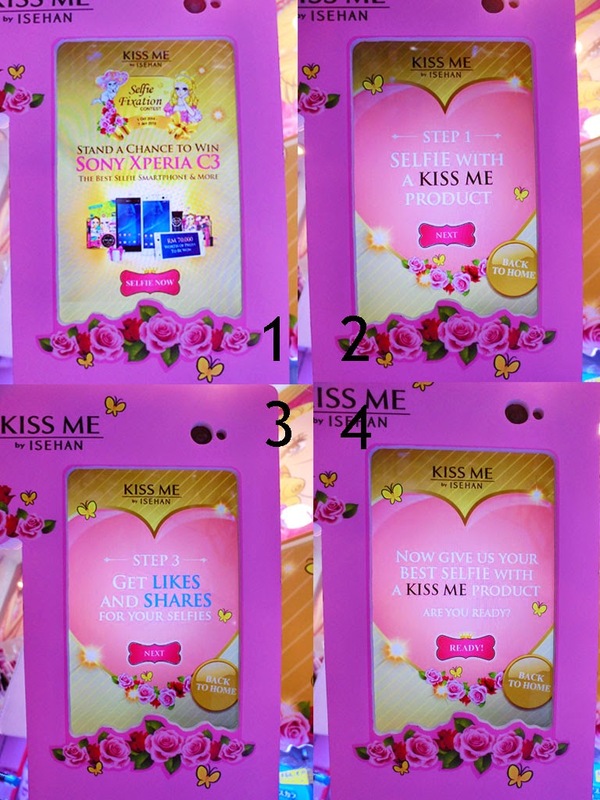 Kiss Me has been holding a KISS ME Selfie Fixation Contest and having the selfie station set up at selected Watson outlet. So glad that I have come across the Selfie contest at Watson, One Utama Shopping Centre weeks ago. 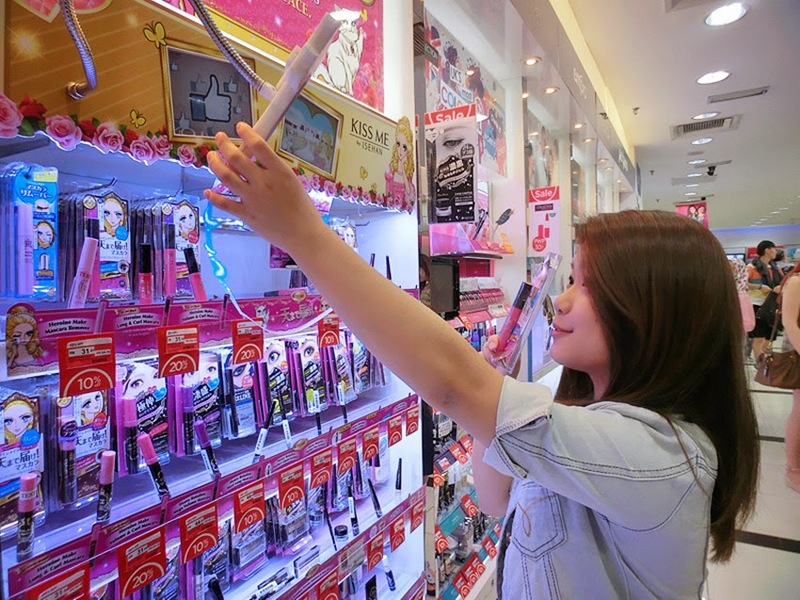 So, this is the selfie machine which is adjustable and flexible in all angle. The mechanism is pretty easy as you'll just need to follow the instructions displayed, simple 4 steps. The next step will be taking as much selfie as you want, until you get the perfect one. After you have picked the best shot, you'll just need to connect to your Facebook account and upload it on your wall. LOL, all of us were pretty excited to join the contest and we have so much fun after all! Share some selfie fun with us too! Do upload it on your Facebook wall, in order to gain 'LIKES' and 'SHARES'. Amazing prizes will be given out!!! 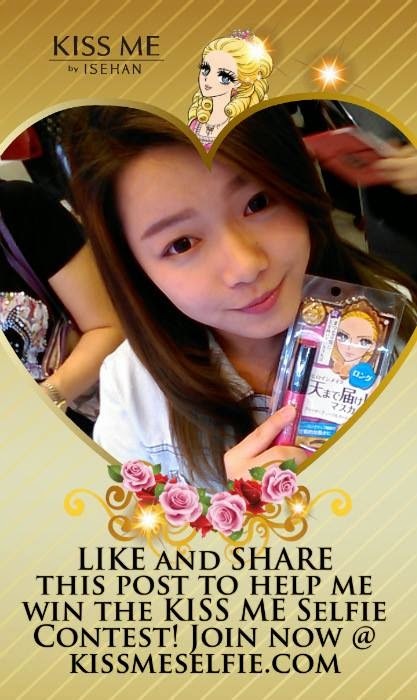 - 1 year supply of Kiss Me products. 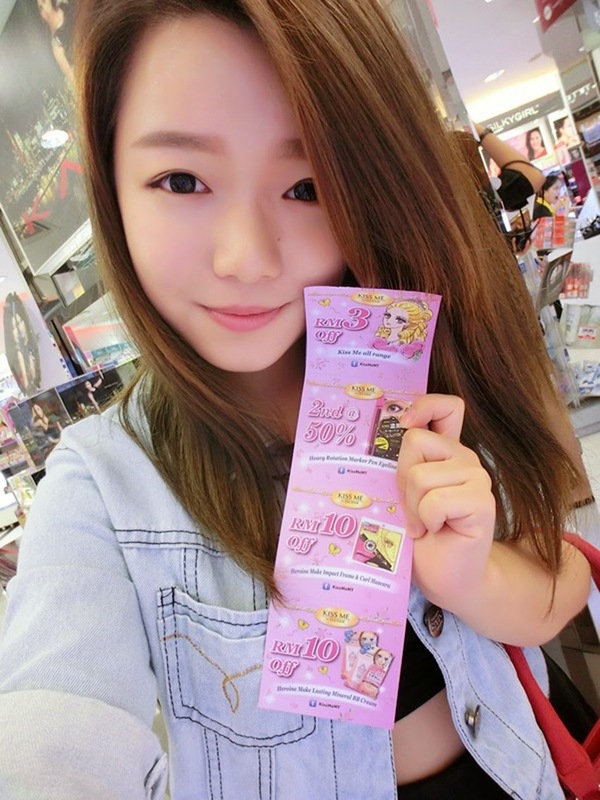 After taking the selfie with any Kiss Me products, I was given vouchers as a token of appreciation! 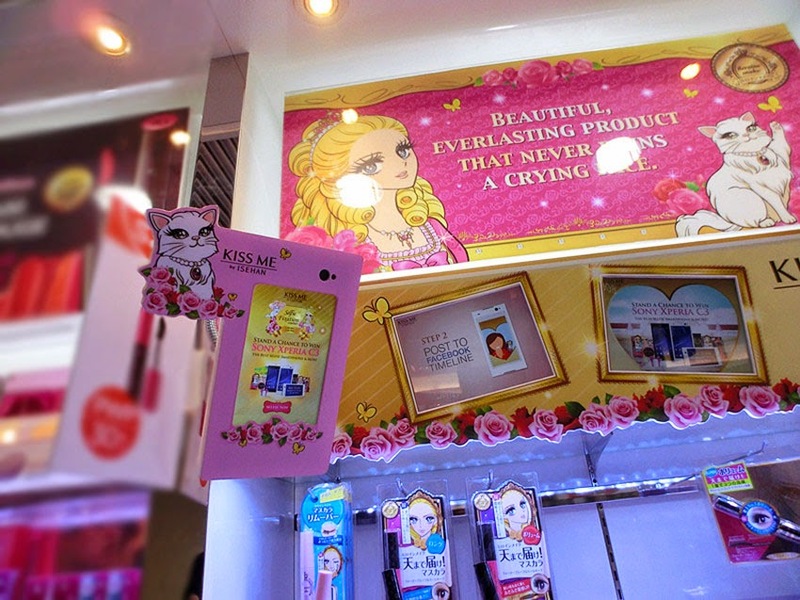 Customers who purchases Kiss Me products on the spot with or without using the vouchers are entitled to enter a weekly lucky draw worth RM100. OMG, what are you waiting for?? sharing and like gaining period from 1 Oct - 7 Nov.
sharing and like gaining period from 1 Nov - 7 Dec.
sharing and like gaining period from 1 Dec - 7 Jan'15. The first round starts now! 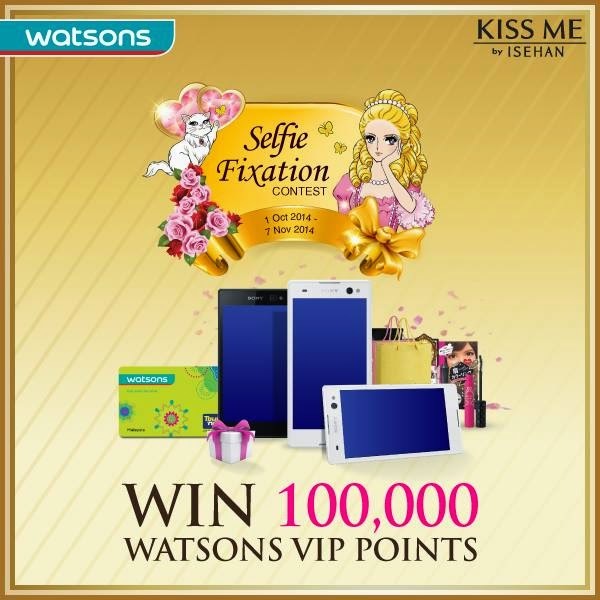 For more information about Kiss Me Selfie Fixation Contest, feel free to visit Watsons outlet mentioned above or Kiss Me Facebook Page.